This program is aimed at all those who are interested in supporting the FSP and its activities in favour of contemporary creativity and scientific research. Support, whatever the chosen method, will coincide with our shared values or offered within a logic of intercultural dialogue. On an Annual basis, you can take part in and be updated on all the initiatives of the Foundation, choosing among four types of “FSP Card", which correspond to each of the special benefits. Designed for Agencies and Institutions that share the FSP mission and can act via flexible forms of technical and/or economic support, on a long term basis or within specific initiatives and projects. This is designed for non-institutional partners, such as companies, interested in promoting their brand via the FSP integrated communication program; the sponsor takes part in specific initiatives and projects. For the donor, the chance to take active part in promoting the FSP mission and/or have a guaranteed programme of conservation, fruition and valorisation of your heritage. A chance for FSP to promote cultural initiatives and to widen the heritage base for new projects. Simple and at no cost, in Italy you can donate 0.5% of your tax return. The FSP is a cultural non-profit organization, with operation guaranteed by a group who offer their expertise and time without cost. This is another way to support the project. 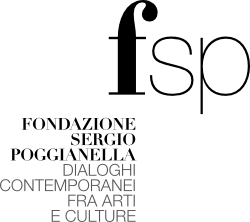 FSP designs and promotes fundraising initiatives aiming to help contemporary artists.